During these cold months we all want something warm, nutritious and quick to rustle up. I'd never made - let alone eaten - noodle soup before, but it sounded like ideal comfort food without being being too filling. Full of protein and vitamins, it's good wholesome food that is healthy, yet doesn't leave you hungry. 1. Wash and chop the mushrooms and pak choi. 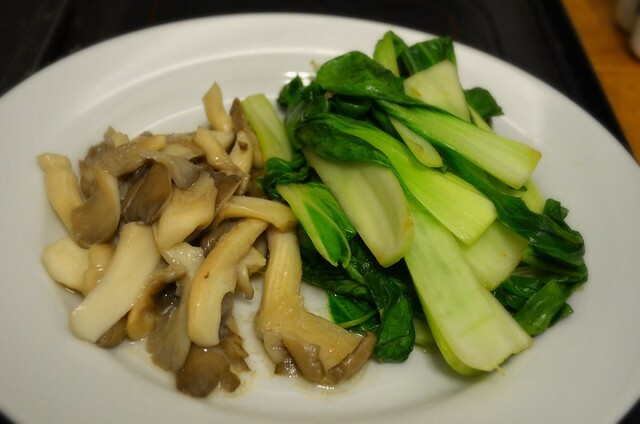 I cut the pak choi in half lengthways and kept the mushrooms fairly large as both will reduce anyway once you start to cook it. 2. For the time being leave the rice noodle soaking in a bowl of cold water. 3. Shallow fry the pak choi, spring onions and mushrooms in a pan and place to one side afterwards. This is optional as you could always just cook these all in the broth later if you prefer. However I wanted them all to soak up the beautiful juices coming from the mushrooms. Save the leftover liquid to add to the soup later. 4. Add the water and miso paste into a saucepan and slowly bring to the boil. Once boiled, continue to simmer. 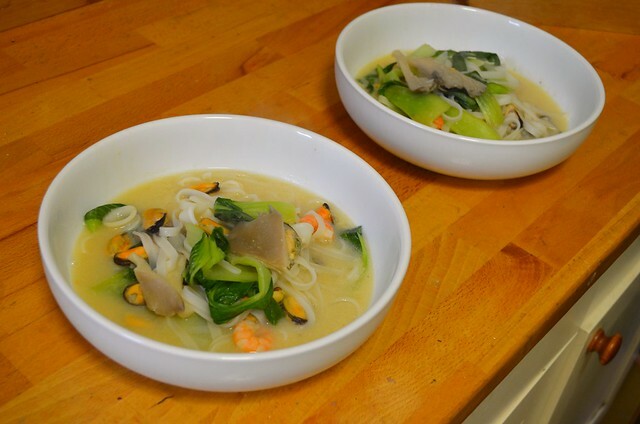 You can add vegetable and chicken stock if you wish, but when I tasted mine, it seemed perfect as it was. Particularly as I knew I'd be adding seafood to the mix later anyway. 5. 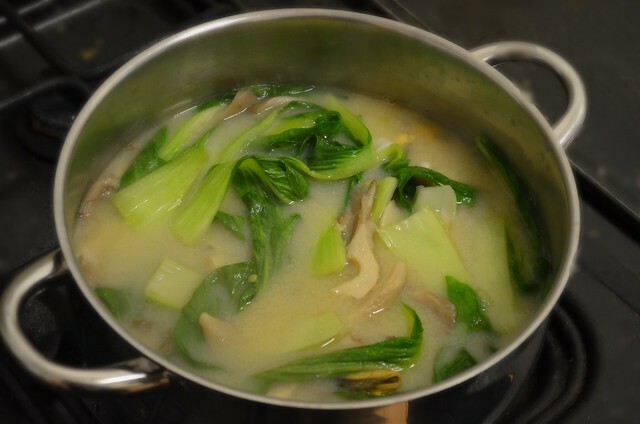 Gradually add the pak choi, mushrooms and spring onions. Then add the seafood and cook until ready. I bought a pre-cooked seafood pack so it only needed 2-3 minutes to heat through. 4. Time for a taste test! Add vegetable / chicken stock if you feel it needs it. 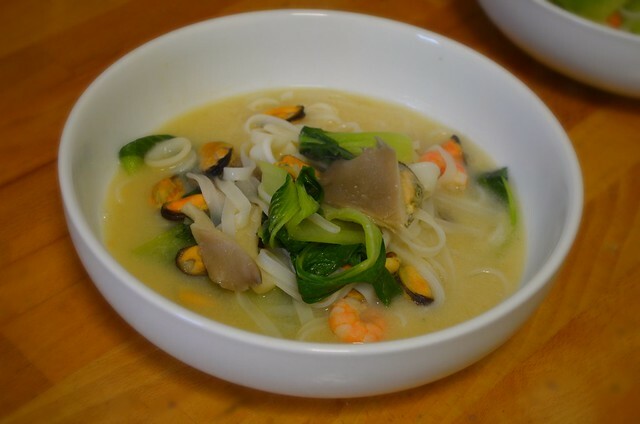 However I found the blend of miso and the liquid from the seafood already flavoursome enough. 5. Drain the noodles and remove from the bowl of cold water. Add them to the rest of the soup. These will only take a minute - if that - to be ready. 6. Serve generous ladlefuls into two bowls and enjoy! Makes enough for two servings - however we found we had plenty left over for lunch during the week. Although by this stage the noodles had soaked up most of the miso soup rendering it more like noodles with a sauce rather than noodle soup. But trust me, all the flavours are still there. I cannot emphasise how quick and easy this dish was to prepare and cook - not to mention incredibly tasty and satisfying for a cold winter's evening. If you decide to give this a try, make sure you Tweet me @Lucy_Angele using the hashtag #cookwithlucy or to leave me a comment below as I'd love to hear about your creations! It really was nice - looked good and tasted great! Plus it's healthy which is always a bonus! The leftovers were just as tasty! The noodles had absorbed all the soupy goodness! I don't eat seafood (being a veggie) but looks great. Will have to make a veggie version.